Today was the day of NEB-ULCA game so we decided to stay close to home and do a quick early morning trip. We got out there before sunrise and were on the water for the whole morning. It was breezy and cloudy with a few sprinkles. The water temp was still around 75 degrees which was hotter than I expected since we had a few days that were in the 60’s. Since the water temperatures were still high and we were there early in the morning I had thought that topwater would really be good this morning but surprisingly we tried about every topwater we had and didn’t get a strike. We also didn’t see anything surfacing so we quickly changed our approach. 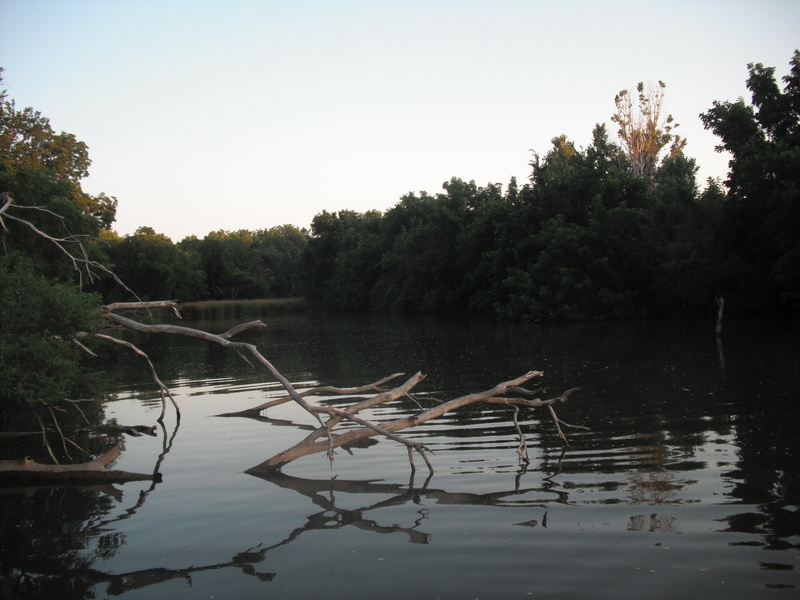 Just to the east of the boat ramp there are a lot of sunken trees that sit in 5-8ft of water and we ended up getting into some small largemouths there fishing slowly and deeply with a blue texas rigged 8” plastic worm. We still were finding the fish we wanted to so we continued to move around the lake. Fishing briefly on the dam with no luck. We then passed over the channel in the middle of the lake wondering if we would mark more fish where the depth dropped from 10ft-18th, and we trolled swimbaits and crankbaits over the edge with no luck and not even marking fish. Our time was running out (didn’t want to miss kickoff) so we tried one last location on the western side of the lake where the creeks run into the main lake and it was so shallow we actually grounded the boat. We then packed up and went home to watch the game. This is the 2nd or 3rd time I have fished standing bear and it looks like a great lake but I have not had much success. I have never been skunked but never thrilled about the trip either. If I had more time I would chose to fish somewhere else. Great park area and good boat ramp and lake structure but the fishing was really slow and there is always a lot of traffic at the lake. 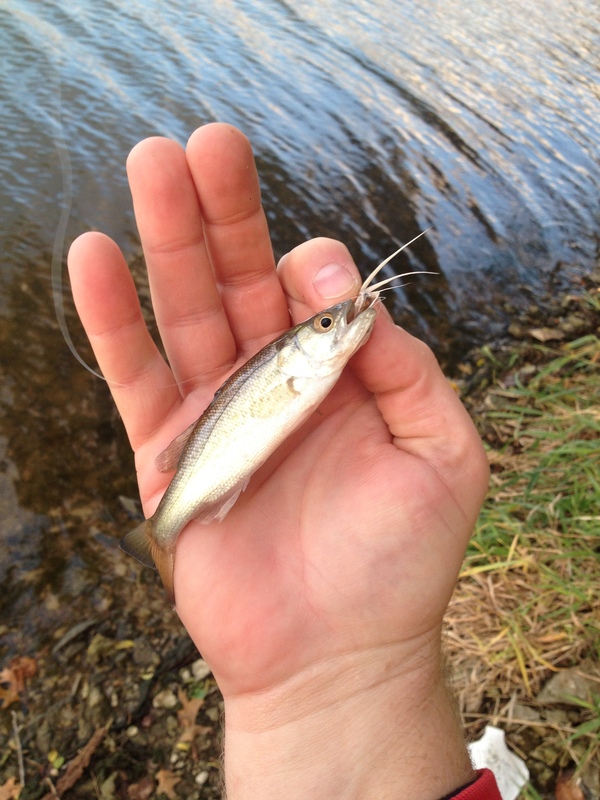 I had recently checked the stocking reports and noticed they had stocked a lot of trout in Standing Bear in October. 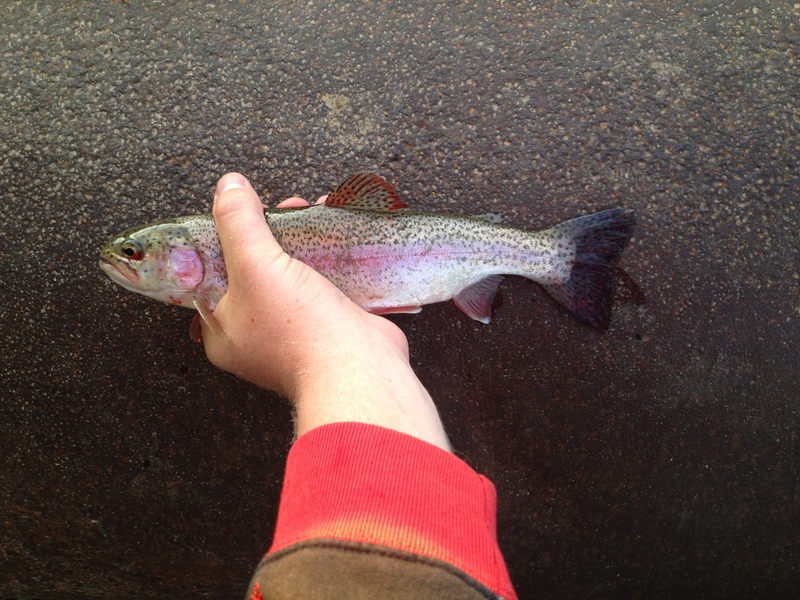 I have caught trout before in Colorado and in Long Pine NE but not at the lakes in town. And knowing that trout taste delicious I figured it would be a good opportunity for me to put some fish in the freezer for the winter. This turned out to be a good opportunity, we do not have any kids yet so while everyone one else was out trick or treating we were trying to find something to do. My wife was also under the weather that day so I rented a redbox and ordered her a pizza, tucked her in on the coach and headed for the lake. 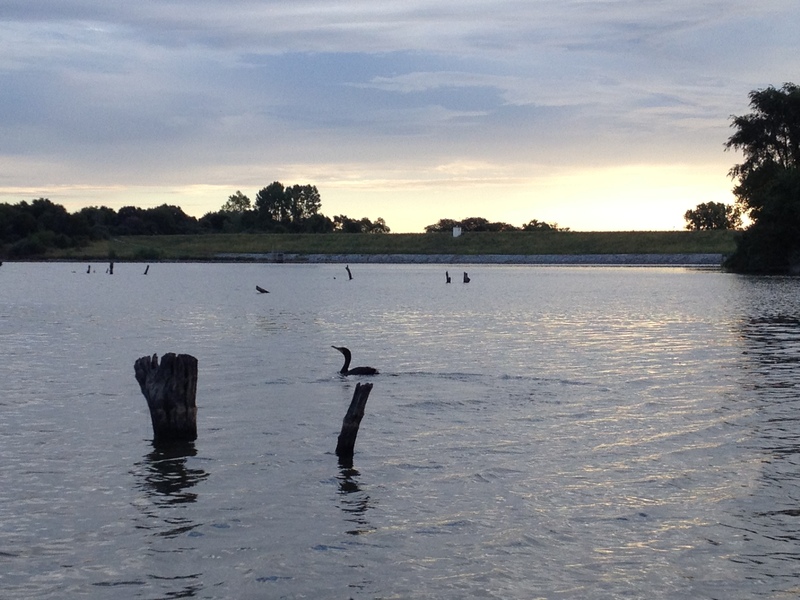 I fished right near the boat ramp near the dock and the rocks. I only threw 2 different kinds of lures, one was a small white trout spinner, which caught 3 nice trout, a really small bass and also a decent probably 12-13 inch bass. Then I also used a light bobber with a crappie jig about 2 feet down and I would cast and pull this in. There was only one other fisherman out there that day and he was fishing off the dock catching some nice crappies. In Nebraska the limit on trout is 5 and after catching my limit it was getting pretty cold anyways. So I headed home to clean the fish and put them in the freezer. 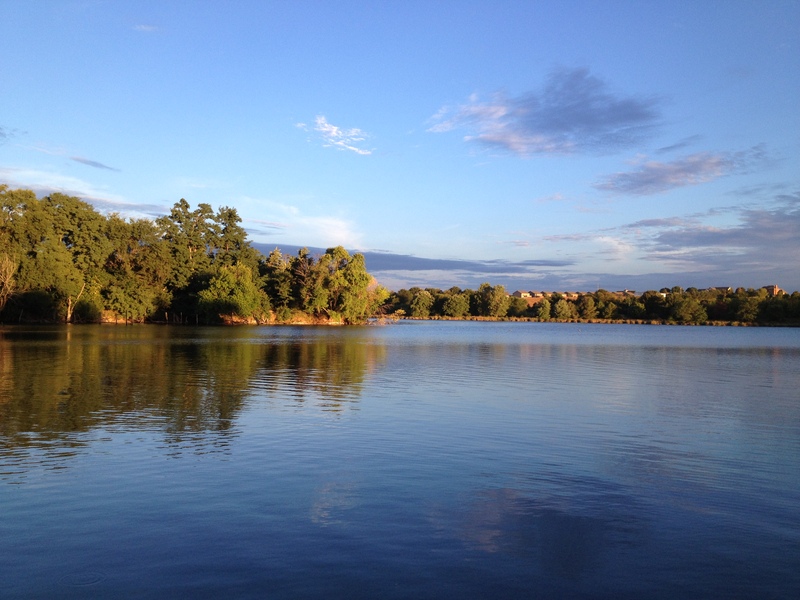 The lake is a good size with depth and a good boat ramp. I just haven’t every had a really good day fishing here and its always been busy. Today was the day of the NEB-UCLA game, so we decided to stay close to home and do a quick early morning trip. We got out there before the sunrise and were on the water for the whole morning. It was breezy and cloudy with a few sprinkles of rain. The water temp was still around 75 degrees which was hotter than i had expected since the previous few days were in the 60’s. Since the water temperatures were still high and we were there early in the morning I had thought that topwater would really be good this morning but surprisingly we tried about every topwater lure we had and didn’t get a single strike. We also didn’t see anything surfacing so we quickly changed our approach. 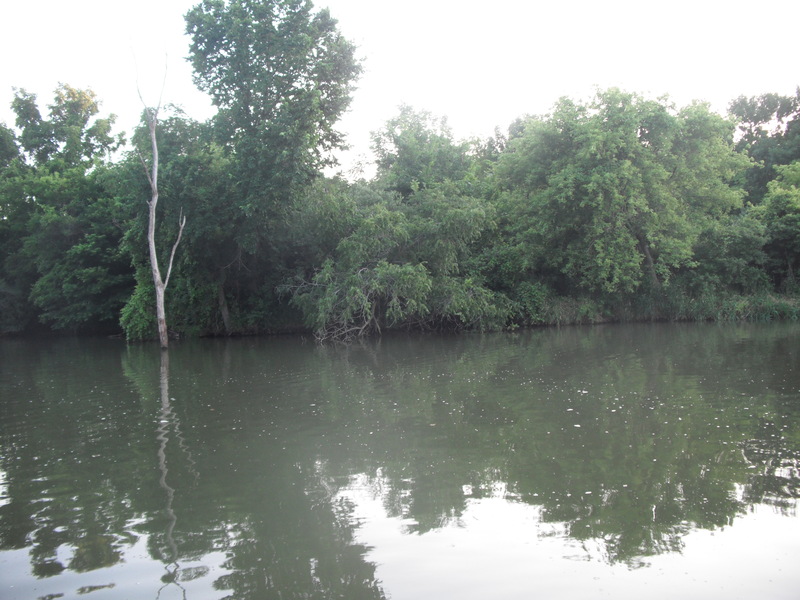 Just to the east of the boat ramp there are a lot of sunken trees that are in 5-8ft of water and we ended up getting into some small large mouths there fishing slowly and deep with a blue texas rigged 8″ plastic worm. We still weren’t finding the fish we wanted to so we continued to move around the lake. Fishing briefly on the dam with no luck. We then passed over the channel in the middle of the lake wondering if we could mark fish where the dept dropped from 10ft-18ft. We tried trolling lures across this depth change with crankbaits and swimbaits but still had no luck and didn’t even mark many fish. Our time was running out (we didn’t want to miss the kickoff) so we tried one last location on the western side of the lake where the creeks run into the main lake and it was so shallow we actually grounded the boat. We then packed up and went home to watch the game. this was the 2nd or 3rd time I have fished this lake and it looks like a great lake but i have not had much success. I have never been skunked but never thrilled about the trip either. If I had more time I would have chosen to go somewhere else. Good looking lake with good ramp and structure, I’ve just never caught a lot of fish or any of really good size. Today we had a short window of time to get out and actually fish but since the weather was so nice we couldn’t pass up the opportunity. So instead of heading out of town, we chose Standing Bear which is about 5 minutes from where I live. 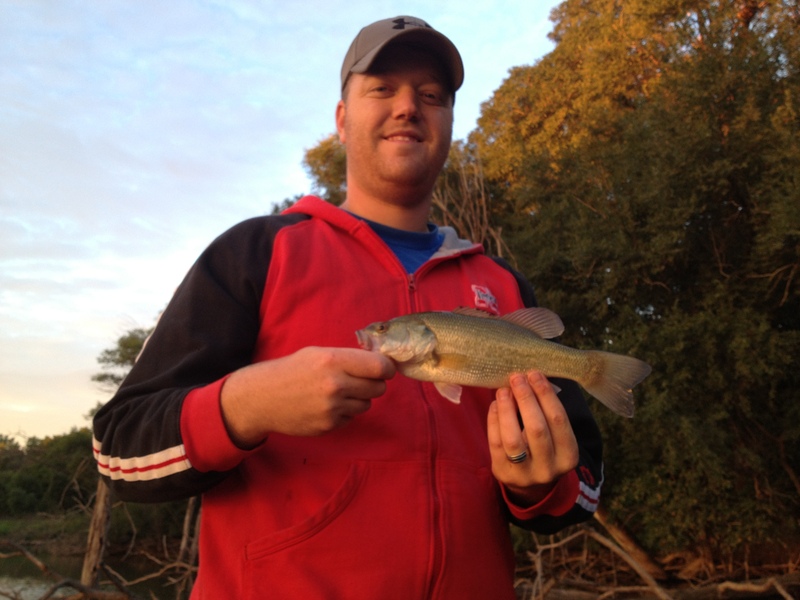 Also Scott had been there earlier this week with some success using a top water frog. We started fishing along the south side of the lake by the boat ramp and quickly noticed how many other people were on the lake. There were approximately 15 kayaks or canoes on the lake, I believe for a boy scouts event. Also about every 50-100ft on the shore line there was somebody with a set line. So we attempted to bounce around them for a little bit with little success. 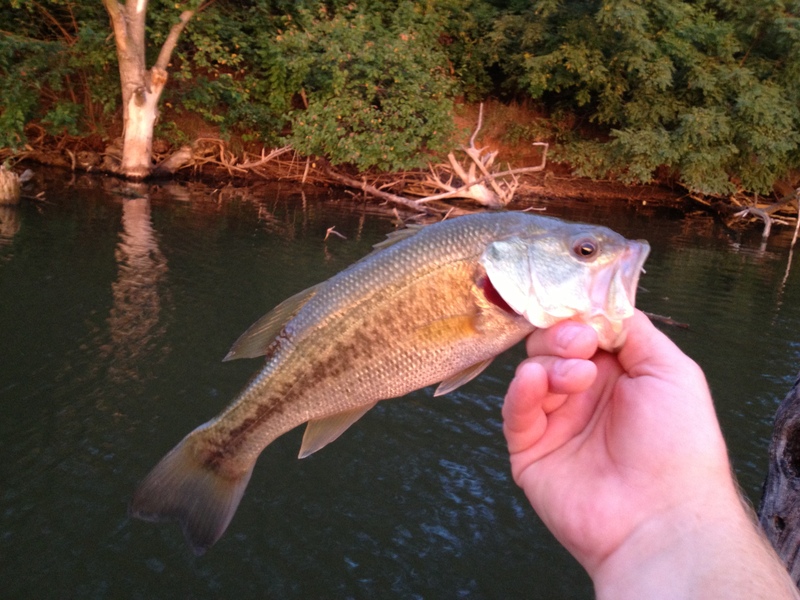 We did also take into account that the bass would typically be in their summer patterns by now, so deep points might be a good option. That mixed in with the heat and the extremely clear water in the lake, we had to adjust our fishing methods. We threw about everything at them with only a few bites here and there but hadn’t pulled anything in yet. We tried fishing in the large cove on the south side and along the dam as well and were seeing a lot of schooling fish out in the open water but couldn’t convert that into any real strikes. Finally as the sun started to set, the temperature dropped and the visibility got worse we started getting some strikes. I believe as a result of the conditions the bass were hanging out deeper and not feeding as much until the temperatures cooled and the traffic on the lake lessened. 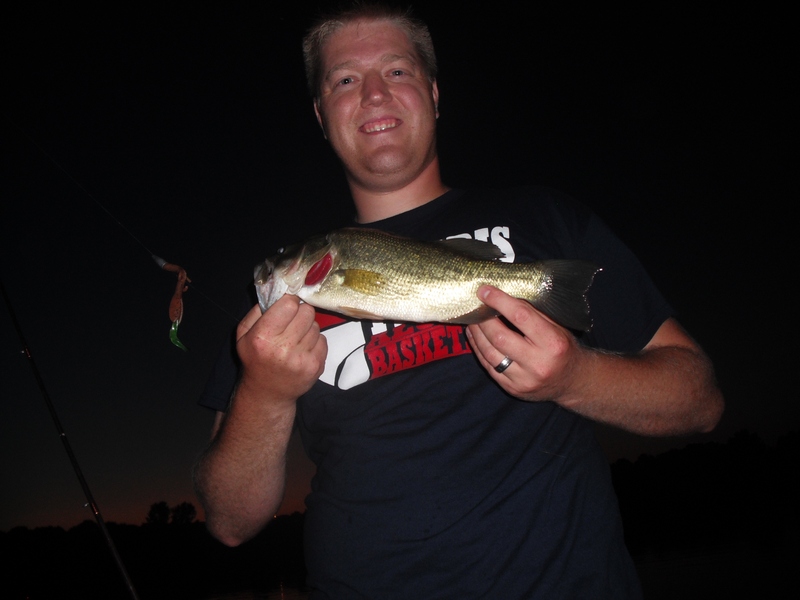 We ended up with a few good bites, a few fished hooked that got away and caught one 14 inch bass near the end of the night (as pictured below). So we were a little disappointed we didn’t catch more fish but we did find them eventually and we had to fight a crowd of people to do it. It is a good place to go if you live in Omaha and want to get out for an hour or two some evening. But if I had the time, I would go further out of down just because of the traffic on the lake. 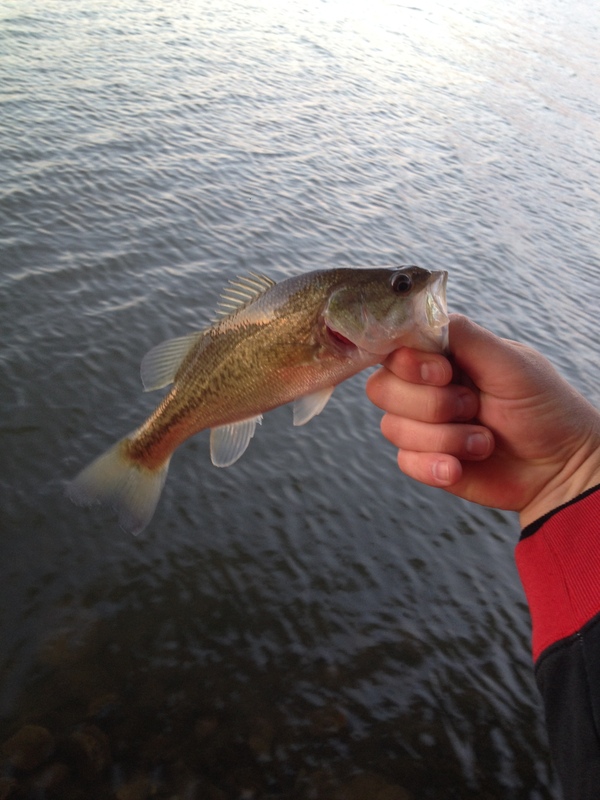 The fishing is somewhat slow and the fish are usually small. But it is nice when you can get to the lake in 10 minutes.